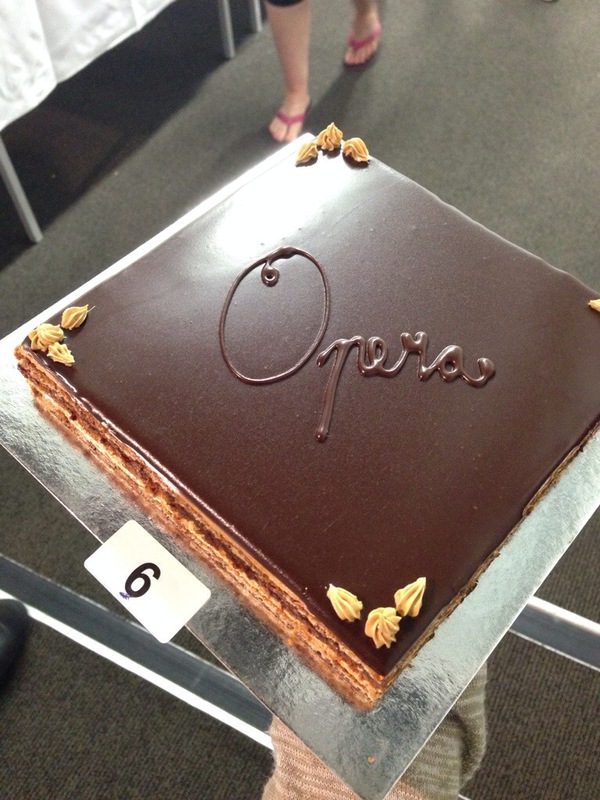 So, this was my opera gateau for pastry exam. 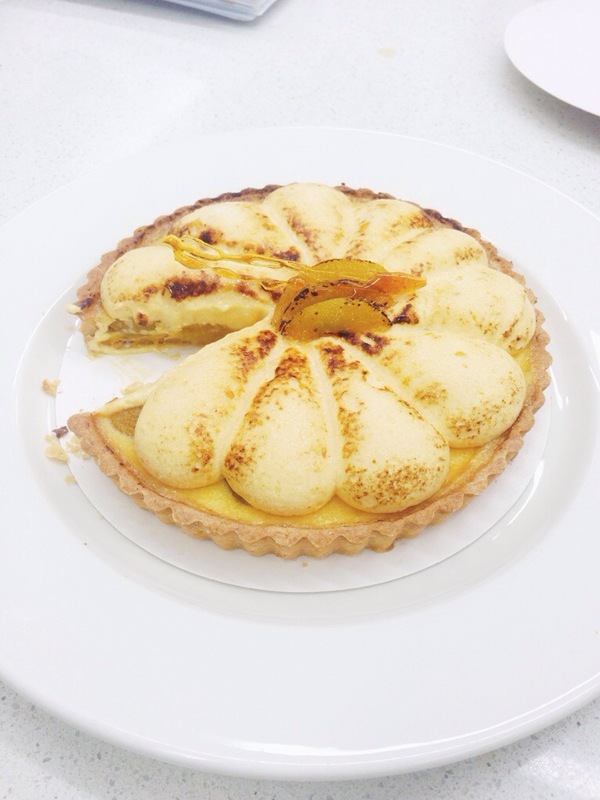 Both exams (cuisine and patisserie) went really really well and I was really happy to hear the good feedbacks from the chefs. I really enjoyed this semester, I’ve learned a lot. Next term is my last one, Superior level, 3 more months to go and I’m done! Superior is going to be amazing and exciting. I can’t wait! 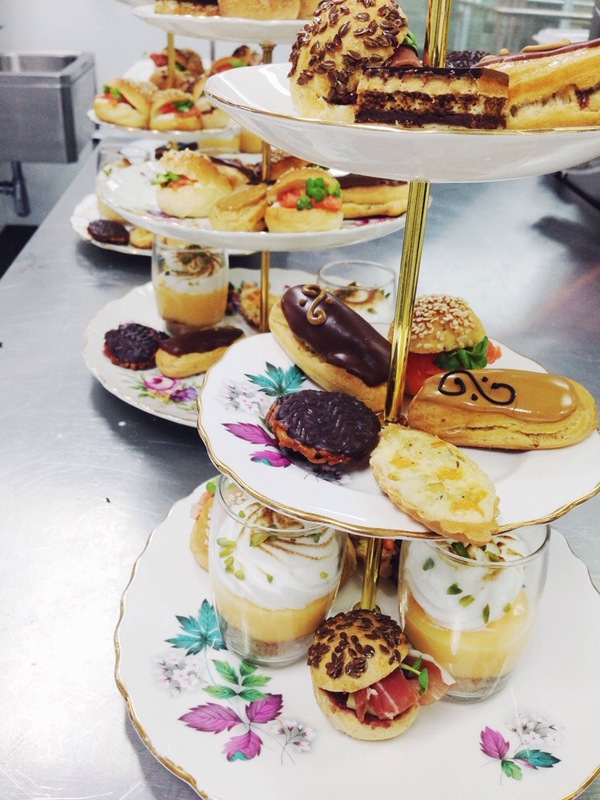 Thank you to all the amazing chefs in Le Cordon Bleu Wellington. I’m flying off back to my hometown and I’m gonna be back in Wellington in April. More food posts ! Fraisier torte is a french strawberry torte. A torte is a multilayered cake that is filled with various types of cream or fruits. 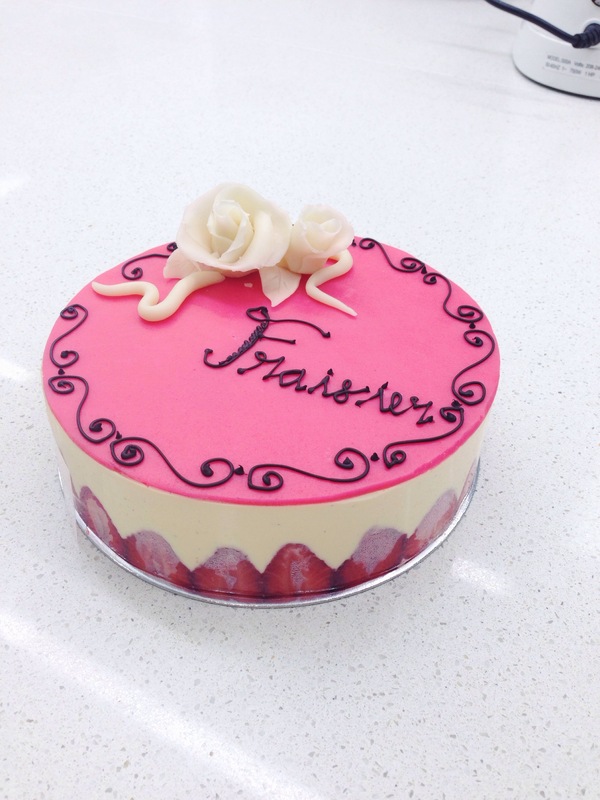 The fraisier torte that I made was layered with genoise sponge (imbibed with punch syrup) ,sliced strawberries and mousseline cream. 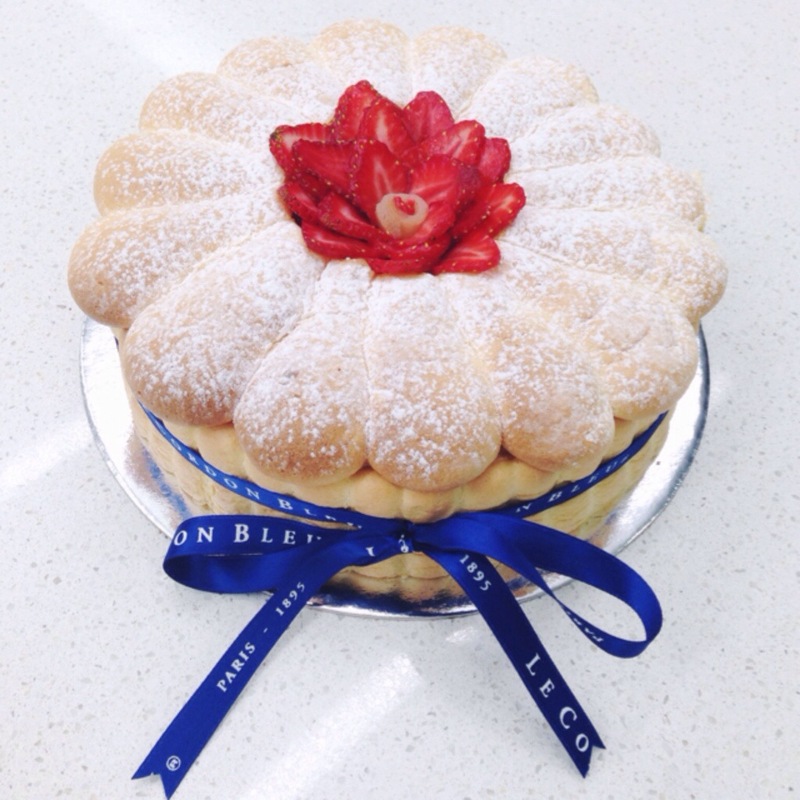 Mousseline cream is a pastry cream that is combined with butter until it is light and fluffy (increase in volume). We could also add flavour to the mousseline by adding a little bit of kirsch or cointreau. I garnished the top of the cake using a marzipan and chocolate writing. Marzipan is made of sugar, honey and almond meal. It is really fun to work with marzipan as you can turn it into any shape that you want. In this lesson, I shaped the marzipan into flowers and leaves. I also use a marzipan for the base of the flowers and I coloured it pink. Unfortunately, my chocolate writing on the cake wasn’t good enough and it kind of ruined the cake. I was really sad because otherwise everything else was perfect. However, I finished making the cake and the taste was absolutely delicious. 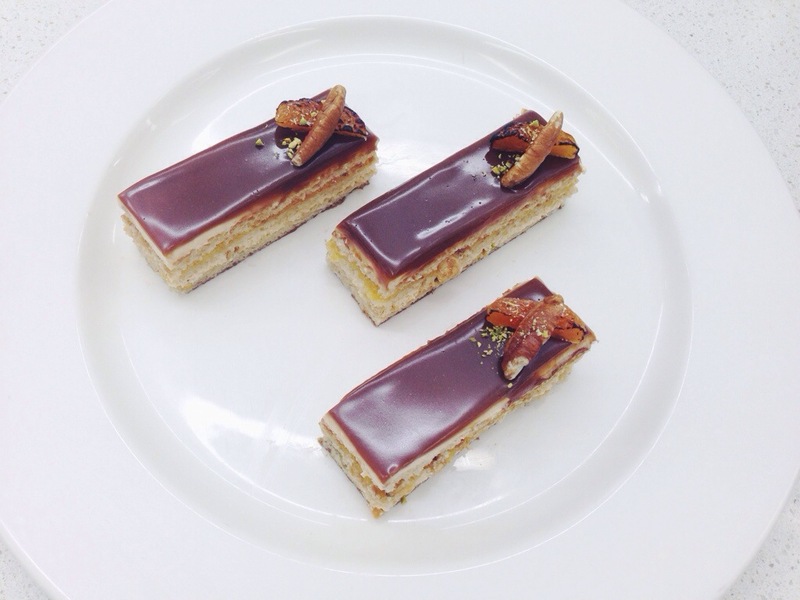 Entremet – Praliné bavarois layered with succes biscuit and lemon curd. Honestly, this is the most delicious cake I’ve ever eaten. 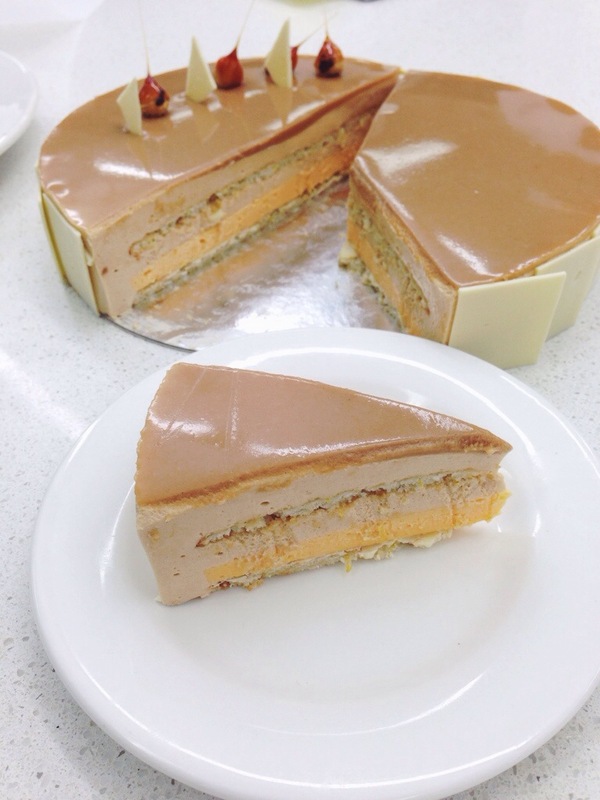 Praline bavarois has a sweet creamy nutty taste and the lemon curd in the cake balances the flavour. It is best served cold and this cake is very refreshing. I decorate the cake with Praliné Glaze on the top, some nuts and tempered white chocolate. YUM ! Charlotte Poire is another french classic. The cake is made of layered sponge, pear and pear bavarois. Bavarois is basically crème anglaise that has been thickened with gelatine.